I meant to write this blog, analysing the books I read in 2018, at the turn of the year, but as I’ve been chasing a January 14 deadline, it’s arrived a little later than planned. I read 89 books in 2018 – four more than I read in 2017 – of which 46 were by male writers (compared to 49 the year before), 30 were by female writers (compared to 28 in 2017), and 13 were anthologies (a jump from 8 the previous year), containing stories by writers of both sexes. 60 of the 89 books were novels, 4 were novellas, 10 were single author collections, and only 2 were non-fiction books – numbers which pan out pretty similarly to the year before, give or take a couple of books here and there. As in 2017, 7 of the 89 books I read were tie-ins, and they even correlate pretty exactly to the previous year, with 4 of the 7 being DOCTOR WHO books (novelisations of recent TV stories, which even used the long-defunct Target logo – a real nostalgia rush! ), and the other 3 being original GRANGE HILL novels. My intention in 2017 was to read tie-in novels/novelisations of either/both THE SWEENEY or/and THE PROFESSIONALS in 2018, but in the event I didn’t get round to either. I do have the same intention for 2019, though I’m not sure I’ll get round to both, as my priority is to make more of a dent in my ever-growing backlog of DOCTOR WHO books this year. If I had to choose between THE SWEENEY and THE PROFESSIONALS, I’d almost certainly favour THE SWEENEY, as the tie-in books produced from that series were original novels, whereas each book in the 15-strong THE PROFESSIONALS series contain a novelisation of a TV story I’ve previously seen. I think it’s more likely I’ll start reading THE PROFESSIONALS once I’ve worked my way through all the GRANGE HILL books in two or three years time. Of the 89 books read in 2018, 69 were by writers I’d read before (20 of which I’d read books by the previous year), and 20 were completely new to me. Of these latter 20, some were long-established names that I’d been meaning to read for years but had only just got around to, such as Leslie Charteris, Kathe Koja, Patricia Highsmith, Margaret Atwood and Val McDermid, and others were authors celebrating the release of their first novel or collection, such as Emma Cline, Nick Setchfield, Priya Sharma, Jac Jemc, C.J. Tudor and Jane Harper (whose first novel, The Dry, I enjoyed so much that I read her second, Force of Nature, a few months later, as soon as it was released in paperback). As ever, as well as stand-alone novels, I also read novels that continued various series’ of books I’m working my way through – although in the case of Agatha Christie, I’m reading her books haphazardly, veering between her POIROT, MISS MARPLE and stand-alone novels at the rate of four a year (she wrote around 80 books in all, so my aim, fate willing, is to get through her entire output in twenty years; and having started this venture in mid-2015, I’m currently 15 books to the good). Aside from Agatha Christie, I also read books numbers 27, 28 and 29 of the Alfred Hitchcock and the Three Investigators series, and book number 8 (Burning Angel) of the DAVE ROBICHEAUX series by James Lee Burke. I read book 2 in Dennis Lehane’s KENZIE and GENNARO series (Darkness, Take My Hand), book 2 in Angela Slatter’s VERITY FASSBINDER series (Corpselight), and the 2ndbooks of a pair of trilogies I started in 2017 – Tim Lebbon’s The Folded Land (from his Relics trilogy) and Ramsey Campbell’s Born to the Dark (from his Brichester Mythos trilogy). Despite not finding time in 2018 for the next books in several other series I’m working my way through (John Connolly’s CHARLIE PARKER books, Paul Finch’s HECK novels, Ruth Rendell’s WEXFORD series and John D. MacDonald’s TRAVIS McGEE books), I (perhaps foolishly) started two new series in 2018. As previously mentioned, I read Jane Harper’s first two books, The Dry and Force of Nature, featuring her character AARON FALK, and I also read the first of Val McDermid’s TONY HILL and CAROL JORDAN novels, The Mermaids Singing. Having read only one collection by a female writer in 2017, I vowed to read more in 2018, but doubling that number from one to two (of 10 collections read in total) is admittedly rather less than I had in mind. I’m confident, however, that that number will increase in 2019, as I already have several collections by female writers on my TBR list that I’m really looking forward to – by the likes of Thana Niveau, Mariana Enriquez, Emma Donoghue, Tracey Fahey and Patricia Highsmith. Having read only 8 anthologies in 2017, I was determined to read more in 2018, and achieved that by pushing the number up to 13. Of those, 5 contained mostly reprint fiction – Best New Horror 27,Best Horror of the Year 10,The Valancourt Book of Horror Stories 2, The 6thFontana Book of Great Horror Stories and The 6thFontana Book of Great Ghost Stories – but the other 8 contained all-original stories. I only read 2 non-fiction books in 2018 (half of what I read in 2017), one of which was Mark Chadbourn’s Testimony, aninvestigation into an allegedly haunted Welsh farmhouse, and the other of which was Scarred For Life, a massive nostalgia-packed tome of pretty much everything that scared the generation of kids (myself included) who grew up in the 70s, from movies and TV series, to potential nuclear attack, the threat of rabies, and a wide variety of everyday hazards catalogued in numerous Public Information Films. At 740 large pages, most of which were packed with dense type, this was the longest book I read in 2018 and took me almost three weeks to get through. Needless to say, I can’t wait for Scarred For Life Volume Two: The 1980s, which is due out later this year. So what’s on the agenda for 2019? More of the same, I hope. More novels, novellas and collections by writers old and new; more anthologies; more continuing series; more tie-ins; more non-fiction. For the past few years I’ve been intending to read more graphic novels, and so that’s something I want to add to my 2019 reading list. I have Marvel’s four-volume Essential Tomb of Dracula on my TBR list for 2019, plus Joe Hill’s six-volume Locke & Key series. I also have a hankering to re-read my old Tintin books in series order, so don’t be surprised if a few of those also make an appearance on my Books Read list in 2019. As always, have a great year – and happy reading! I’ve always been an avid reader, and since 1985, when I was twenty-one, I’ve kept an annual ‘Books Read’ record. When I started out it was a private record only, kept in an old diary. Thirty-three years later it’s a public one, in the form of an Album on Facebook. I’m not alone in this questionable pursuit. Other people keep reading records too, and being someone who not only loves reading but who also loves knowing what other people are reading, I must admit I spend more time than is probably healthy browsing my friends’ ‘Books Read’ albums on social media. I appreciate it’s a pretty geeky occupation, and not for everybody, but for my fellow bibliophiles – and, of course, for my own satisfaction and amusement – here’s a breakdown of my own reading year. In 2017 I read 85 books, of which 49 were by male writers, 28 by female writers and 8 were anthologies, containing contributions by writers of both sexes. 62 of those 85 books were novels, 4 were novellas, 8 were single author collections and 4 were non-fiction books (one of which, WE ARE THE MARTIANS edited by Neil Snowdon, was also an anthology). 7 of those 85 books were tie-ins, by which I mean books tied in to an existing TV or movie franchise. 3 of those were DOCTOR WHO books (2 original novels and an anthology), 3 were original GRANGE HILL novels, and one was an original novel using characters from the short-lived DOCTOR WHO spin-off series CLASS. A quick aside: I love tie-in books, and have written a fair few of my own – for DOCTOR WHO, TORCHWOOD, HELLBOY, SPARTACUS etc. As a kid I read tons of tie-ins, most prominently the DOCTOR WHO Target novelisations, which gave me many cherished hours of happy reading, but also novelisations of other TV shows such as THE NEW AVENGERS, STAR TREK and even sitcoms like PORRIDGE. Back then, when the idea of actually owning your favourite TV shows on tape was still a wild fantasy, books were the only way of re-capturing classic episodes. Next year I intend to read not only more DOCTOR WHO and GRANGE HILL books, but also novelisations of favourite cop shows from yesteryear like THE SWEENEY and THE PROFESSIONALS. Such books were often cheap knock-offs, written at speed and for little money, and often put out under a pseudonym, but I love them for their simplicity, their conciseness, and for their associations with simpler times free of adult cares. Indeed, I regard them – like Anthony Buckeridge’s JENNINGS books and Richmal Crompton’s WILLIAM books, several of which I’ve also read this year – as comforting little snacks between weightier, more sophisticated courses. Okay, back to the matter at hand, and of the 62 novels I’ve read this year, most I guess can be said to fall within the genres of horror/SF/fantasy and crime – though I’ve always found categorization a slippery customer, and primarily tend to be drawn to books not because they’re of a particular genre, but because they have a particular flavour – primarily because they have something dark, eerie or quirky that appeals to me – or because they deal with human beings in extreme or extraordinary situations. To break down the novels a bit further, some were written by old favourites, writers I’ve been reading regularly for years, such as Stephen King, Ramsey Campbell, Ruth Rendell, Adam Nevill, Stephen Gallagher, Tim Lebbon and Sarah Pinborough, some were by writers I’ve discovered fairly recently, such as Victoria Leslie, Bracken MacLeod, Paul Tremblay, Josh Malerman, David Mitchell and Nina Allan, and some – a surprising 19, in fact – were by writers who were new to me, among which are long-established names such as Ngaio Marsh and Isaac Asimov (both of whom I’d been meaning to read for years) and relative newcomers like Ruth Ware, Thomas Olde Heuvelt and John Darnielle. As well as stand-alone novels, I also have various series constantly on the go, some of which – like the ALFRED HITCHCOCK AND THE THREE INVESTIGATORS books, John Connolly’s CHARLIE PARKER novels and Paul Finch’s MARK (HECK) HECKENBERG novels – I read in order, others – like Agatha Christie’s POIROT and MISS MARPLE novels, and Anthony Buckeridge’s charming and hilarious JENNINGS books – I’m happy to read out of sequence, as the mood takes me. I haven’t been able to make room for books in all of the series I’m currently reading – James Lee Burke’s DAVE ROBICHEAUX and John D. MacDonald’s TRAVIS MCGEE have been kicking their heels this year – but despite this I’ve committed myself to a couple more series in 2017. On the recommendation of friends such as Christopher Golden and Jenny Campbell, I’ve finally got round to reading the first of Dennis Lehane’s KENZIE AND GENNARO books, A DRINK BEFORE THE WAR, and after years of reading Ruth Rendell’s stand-alone psychological thrillers, I finally decided to read the first two of her INSPECTOR WEXFORD novels. Needless to say, I’ll be adding both series to my ongoing roster. I’m surprised to find I’ve only read 4 novellas this year, though some of the novels I read, such as V.H. Leslie’s BODIES OF WATER and Brian Hodge’s WORLD OF HURT, not to mention children’s books, such as Joan Aiken’s THE WOLVES OF WILLOUGHBY CHASE, John Gordon’s THE GIANT UNDER THE SNOW, and the aforementioned GRANGE HILL, JENNINGS and WILLIAM books, are short enough to occupy that strange hinterland between novel and novella. At the other extreme, I’ve also read some stonkingly big books, with Stephen and Owen King’s SLEEPING BEAUTIES, Joe Hill’s THE FIREMAN, Robert R. McCammon’s BOY’S LIFE, David Mitchell’s THE BONE CLOCKS, John Connolly’s THE BLACK ANGEL and Arthur Conan Doyle’s single volume double-header HIS LAST BOW & THE CASE-BOOK OF SHERLOCK HOLMES, all weighing in at over 500 pages each. Moving on from novels and novellas, the 4 non-fiction books I’ve read this year have all been book, movie and TV-based, and 7 of the 8 single-author collections I’ve read have been by men (the only exception is Daphne Du Maurier’s THE DOLL). I’m surprised and a bit disappointed to realise I haven’t read a single collection by a contemporary female writer this year, and this is something I definitely intend to remedy in 2018. In fact, I already have several collections by female authors lined up, such as Sunny Moraine’s SINGING WITH ALL MY SKIN AND BONE, Emma Donoghue’s TOUCHY SUBJECTS and Thana Niveau’s UNQUIET WATERS, among others. I also want to read more anthologies next year. Of the 8 I’ve read this year, one – Neil Snowdon’s WE ARE THE MARTIANS – was non-fiction, one – THE TWELVE DOCTORS OF CHRISTMAS – was a tie-in, and four – BEST NEW HORROR 26, THE VALANCOURT BOOK OF HORROR STORIES, THE 5TH FONTANA BOOK OF GREAT HORROR STORIES and THE 5TH FONTANA BOOK OF GREAT GHOST STORIES – contained mostly reprint fiction. Only two then – Paul Finch’s TERROR TALES OF CORNWALL and Jonathan Oliver’s FIVE STORIES HIGH – contained mostly original (non-franchise) fiction. As editor of NEW FEARS I did, admittedly, read a huge number of short stories beyond mention of my 2017 ‘Books Read’ list, but even so I’d like to read more modern anthologies containing original fiction next year. Okay, I think that’s about it. If you’ve read this far, then you’re clearly as geeky about books and reading as I am. Overall, I’m happy with the scope and quality of books I’ve managed to get through this year, and next year, aside from the tweaks I’ve mentioned, I hope to maintain the balance between genres, formats, genders, old and new writers etc that I feel I’ve managed in 2017. Already my reading list for 2018 is filling up, and is looking mighty exciting – my only problem is that I want to read all the books all at once. Have a great 2018 – and happy reading! I love monsters. I’ve always loved monsters. I know for a fact there are plenty of ‘mature’ adults out there – those who have severed the ties with their childhood selves – who would shake their heads condescendingly at such an admission. I used to be slightly embarrassed to admit the shelves of my study, in which I write my horror stories, were lined with all manner of spooky memorabilia, but I’ve now reached an age where other people’s opinions of my likes and dislikes don’t bother me in the slightest. Monsters make me happy, and if anyone thinks that’s silly and childish, then that’s their loss, as far as I’m concerned. There is a serious element to monsters, of course. Psychologists would tell you they’re embodiments of our primal fears, which is an interpretation I’ll happily go along with. I’d be lying, though, if I claimed that that was their main appeal. You see, for me, monsters are not simply symbolic of humanity’s dark side. They are also glorious gateways to the imagination. What I personally love about monsters – what I’ve always loved about monsters – is that they’re something you’ve never seen before. They’re new, unique, products of a writer’s, or an artist’s, or a designer’s imagination. They don’t exist in the real world; they’re a fresh configuration of the physical. For that reason I find them both visually and mentally exciting. They provide stimulation for the eyes and the mind. But coming back to that point about primal fears for a moment, monsters are, of course, designed to be scary, at least for the most part, and are often portrayed as threatening, as a danger to life and limb. Their purpose is generally to get the blood rushing, the adrenaline flowing. But really effective monsters don’t only frighten us; they also inspire wonder and awe. They suggest there is something beyond the humdrum, the ordinary. They make the world – and sometimes the universe – a bigger, more mysterious place. A numinous place, full of secrets. Of potential. In my journey through life I’ve encountered hundreds, possibly thousands, of monsters – in books and comics, in films and TV shows – but some have made more of an impression upon me than others. When it comes to my ‘favourites’, if you can call them that, it isn’t always their size, or the way they look, that has caused them to burrow deep into my psyche and lodge there like shrapnel. Often it’s simply that they happened to be in the right place at the right time. The five monsters I’ve chosen below are the ones that have made the greatest impression upon me. They’ve done so primarily (though not entirely) because they appeared at particular moments in my life – moments when I was at my most… I guess ‘susceptible’ is the word that springs to mind. Or even simply ‘open’. Between the ages of five and nine I lived in Hong Kong, and it was there, in the magazine section of a supermarket called Dairy Lane, that I saw my first ever copy of Famous Monsters of Filmland. As a kid the magazine terrified me – that iconic logo, the leering, monstrous faces that appeared, one each month, on the covers – but whenever I could I would pick up Famous Monsters and tentatively leaf through it. At that age, I recall, I was always terrified at the prospect of what I might see, of what unspeakable horror I might unwittingly subject myself to, with each fearful turn of the page. I’m pretty sure it was in the pages of this hallowed magazine that I first encountered the shadow-drenched picture below. To my impressionable six-year-old self this picture was terrifying. With his bared teeth and glaring eyes, it seemed to me that Lon Chaney’s Wolfman was the very epitome of savagery and madness. Lit from below, the shadows made it appear as though the Wolfman also possessed small pig-like tusks on either side of his nose, with which I imagined he would tear and rend his victims. In fact, for years I was convinced that he did possess such appendages – to the extent that when I finally saw the film, in my early to mid-teens, I remember being puzzled as to why he didn’t. 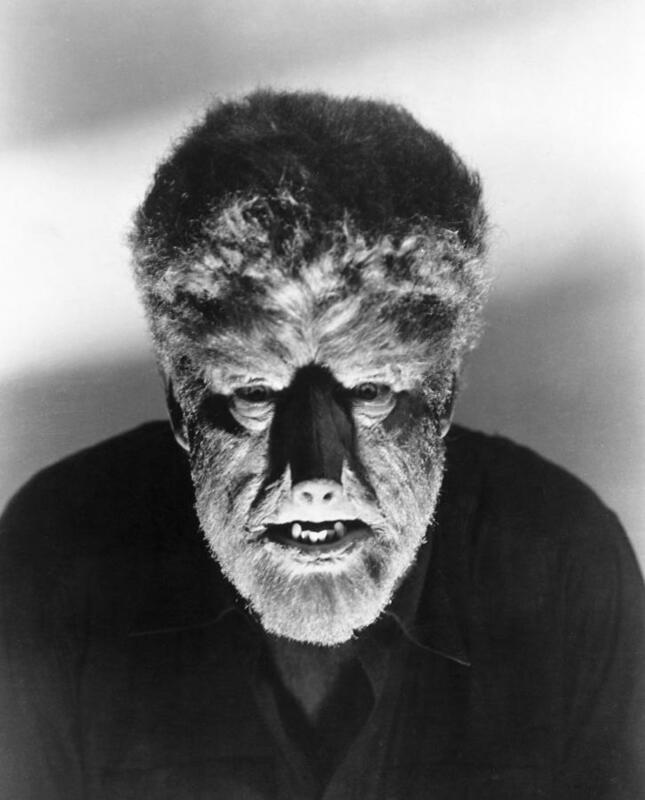 Because of the insane rage encapsulated within that face, the Wolfman, for several years, seemed to me the ultimate monster, one I felt sure would become an unstoppable force when unleashed. Although Frankenstein (which, like many kids, I thought was the name of the monster rather than the scientist), Dracula and the Mummy also scared me, in some ways they seemed to me ‘lesser’ monsters. I felt sure that if it ever came to a fight between the lot of them, the sheer bestial fury of the Wolfman would see him emerge the victor every time. A triumph of design, the Creature, to my childhood self, was both hideous and utterly beautiful. Today I own a model of the Creature, which sits proudly on a shelf in my study, and even almost half a century later my opinion of him is still much the same. His plated, dimpled flesh; his wide mouth and cold, fish-like eyes; the rows of gills sweeping back from the sides of his head, which curiously have always reminded me of mutton-chop whiskers; his overlarge webbed hands and feet, tipped with hooked claws… it’s all so breathtakingly beautiful. He’s scary and alien, and you imagine his flesh to be slick, ice-cold and repellant, but at the same time he has a dignity and grace and poise that I find awe-inspiring, even noble. I was maybe twelve when I first saw Hammer’s The Reptile, and over four decades later it remains my favourite Hammer movie. For me, this film is the very definition of the word ‘eerie’. The blighted village, the isolated cottage on the moors, the haunting music drifting across the stark landscape at night, the troubled and austere local doctor, harbouring a terrible secret… all these elements combine to create a truly unsettling viewing experience that is far more than the sum of its parts. Like another of my Hammer favourites, The Devil Rides Out, this movie seemed, to my adolescent self, to weave a corrupt and deadly spell so powerful that it was capable of curling out from the screen like poisonous mist to infect the viewer. I remember being appalled at the idea of a monster whose bite could turn a man’s flesh black as coal, and cause him to die, writhing in convulsions and choking up white froth. And when that creature was finally revealed about two-thirds of the way into the movie… my God! Its lidless, bulging eyes, its long curved fangs, the sheer serpentine litheness of it – this to me was the very epitome of a nightmare made manifest. To my impressionable self the Reptile seemed both utterly ruthless and utterly lethal, a creature whose venom promised the most awful, the most painful death imaginable. I couldn’t compile this list without mentioning a Doctor Who monster, now, could I? Doctor Who may well be the single biggest influence on my career. It was certainly the first – and probably second, third, fourth, fifth, sixth, seventh and eighth – piece of fiction that frightened me. My first memory of the show was seeing the massive, savage Yeti laying siege to Det Sen monastery in the story The Abominable Snowmen in 1967 when I was four. I remembered being terrified – almost traumatised – on numerous occasions during the following decade, not least by the Ice Warriors, the Cybermen, the seaweed monster in Fury From the Deep, the Autons and the injured Silurian in the barn in one of Jon Pertwee’s early Third Doctor adventures. The Cybermen and the Autons I found particularly troubling. For years I was haunted by the idea that creatures with blank faces could commit such atrocities. Even as a very young child I remember finding the juxtaposition between emotionlessness and murder deeply, deeply disturbing. And of course, I can’t talk about Doctor Who without mentioning the Daleks. It goes without saying that the mental meanies from Skaro are one of the greatest monster designs of all time, whose appearance, even today, can inspire fear and awe. My favourite Doctor Who monster, though, is one that first appeared in 1975 during Tom Baker’s second season as the Fourth Doctor, and who didn’t reappear until the show’s fiftieth anniversary special The Day of the Doctor in 2013. The story Terror of the Zygons was the perfect platform for introducing the titular creatures. Taking place in an isolated village surrounded by moorland and within spitting distance of a lonely stretch of seashore (a location which shares many similarities to the one in which The Reptile takes place, in fact), Terror of the Zygons is a doom-laden tale, underpinned by an eerily evocative music score – incredibly creepy fare for a family audience on a Saturday teatime. By the time the first Zygon is revealed in its full glory at the end of episode one, the tension is as palpable as the thick, soupy fog that envelops Tulloch Moor. I still recall the utter shock I felt when, at the touch of a gnarled, suckered hand on her shoulder, the Doctor’s companion Sarah Jane Smith spins round to encounter the thing looming over her. As viewers we initially catch only a glimpse of it – its bulbous, suckered head, the sheer malice on its puckered, twisted features – before the electronic screech preceding the closing theme music kicks in, and the swirling vortex of the end titles leaves us with nothing but a nightmarish impression to carry in our minds until next week’s episode. In my opinion, the Zygon design – its shape, its colour, its texture – is a work of genius. Like evil, angry fetuses covered in octopus-like suckers, the Zygons possess a body-horror element that is rarely seen in Doctor Who. Add to that their sibilant, hissing voices and their oozing, organic technology, and you’ve pretty much got yourself the ideal monster package. On a panel at a British Fantasy Convention in the late 1980s, the panelists were asked to sum up, in one word, what they thought horror fiction should be. I can’t remember what the other panelists said, but I remember Clive Barker’s answer. He said that he thought horror fiction should be “confrontational”. The stories in that first volume of The Books of Blood – and in the following five volumes, which I subsequently bought and devoured – blew my mind. It’s hard to describe the impact of them today, but at the time they seemed to expand horror fiction to way beyond the boundaries it had previously imposed on itself. It really seemed to me that, thanks to Clive Barker, there were now no limits as far as horror fiction was concerned. And although Clive became known in his early days for the gut-clenching extremism of some of his imagery – an approach that would go on to lay the groundwork for the so-called Splatterpunk movement of the late 80s – it was clear from reading his work that in terms of his imagination alone, from which flowed a seemingly never-ending stream of decadent, dangerous, audacious, perverse and transformative ideas, he was a true visionary. All of these qualities were encapsulated in Clive’s creation of the Cenobites, demonic doyens of pain and suffering, which first appeared in his novella The Hellbound Heart, and were then brought to startling life in the movie Hellraiser. Chief among the Cenobites, of course, was Pinhead, and almost immediately he became an iconic screen monster – and deservedly so. Brilliantly portrayed by Doug Bradley, Pinhead’s striking, fetishistic appearance and sonorous delivery, accompanied invariably by the clinking of chains and the howling of an unearthly wind, is like a living embodiment not only of Barker’s vision, but of late 80s/early 90s horror fiction. It was a boom period for the genre, when anything seemed possible – especially for a young writer like myself, whose first novel rode the crest of the horror wave and catapulted me to instant, dizzying success. Within a few short years I went from reading Clive Barker’s work in my chilly bedsit to sitting beside him at literary events, signing books until our hands cramped up. Whenever I see Pinhead now – and I have a model of him perched imperiously on a pile of books on the corner of my desk – I’m reminded of those heady days. Days when there were no limits, and horror was king. I have always maintained that horror is a genre with very wide – indeed, almost limitless – parameters, and as editor of NEW FEARS (Titan Books) I wanted to illustrate that fact by showcasing an eclectic selection of stories that differ widely in terms of style, content and approach, but which each have an element of horror at their core. In my view horror can be found anywhere, and so here are five novels, which, although marketed as ‘literary’ fiction, I think horror fans would enjoy. THE LITTLE STRANGER by Sarah Waters is ostensibly a ghost story, but it is also a story about a declining way of life and a changing society, about decay and regret, about betrayal and subterfuge and unrequited love and things left unsaid. The story unfolds slowly, almost elegantly, and yet as it does so it evokes a rising sense of unease, a suggestion that dark and terrible things are gradually rising to the surface. Is the ghost in the book real? I’ll leave that for you to decide. But real or not, THE LITTLE STRANGER is nevertheless an intensely creepy and compelling novel. BEING DEAD by Jim Crace is many things: a love story, a thriller, a reflection on the passage of time and the frailty of existence, and a haunting and unflinching examination of brutal violence, death and decay. Both viscerally shocking and unbearably sad, it forces the reader to confront realities he or she would rather turn away from, the unpalatable truths at the heart of existence. Like all good horror stories it makes you squirm. But it also makes you think. THE LIGHTHOUSE by Alison Moore is a disquieting tale of a lonely and socially awkward man who decides to put his broken marriage and equally broken childhood behind him by undertaking a walking holiday in Germany. However a series of misunderstandings causes a sense of menace and foreboding to build within the narrative – a characteristic of Moore’s writing – that in turn makes the reader’s stomach tighten and leads to a growing sense that something utterly appalling is about to happen. Moore’s prose is deceptively quiet and precise, but the escalating feeling of unease she invokes surpasses that to be found in most horror fiction. In the same vein I would urge you to seek out her short story ‘Small Animals’, which was published as a chapbook by Nightjar Press. Quite simply, it is one of the most terrifying stories I have ever read. 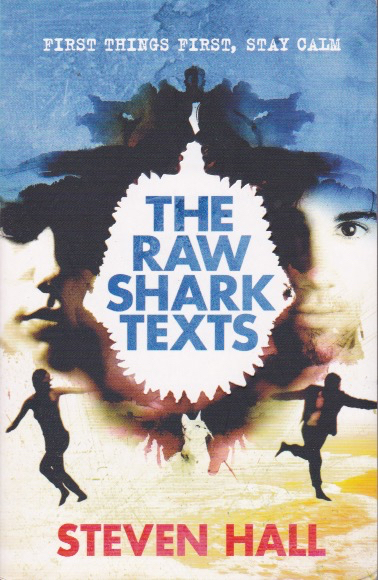 THE RAW SHARK TEXTS by Steven Hall can perhaps best be described as ‘Jaws’ for the modern age. By turns disorientating, witty and hugely inventive, it’s the tale of a man who, after waking up with amnesia, comes to believe he has unwittingly activated a conceptual shark called a Ludovician, which “feeds on human memories and the intrinsic sense of self”, and which is relentlessly pursuing him with the intention of utterly devouring everything that he was, is and ever will be. Although shot through with humour, THE RAW SHARK TEXTS is intrinsically a gut-churning, heart-thudding story of a man with a ferocious monster on his tail. A monster that, if it catches up with him, will devour him body and soul. THE WOODWITCH by Stephen Gregory shares thematic similarities to Jim Crace’s BEING DEAD, in that it is a visceral tale about death and putrefaction. It is so visceral, in fact, and so powerfully evoked, that the stench of decay seems to emanate from every page, enveloping the reader in a fungal miasma of rot and damp. But just as decay permeates the lonely cabin and the surrounding forest in which the story is set, so it also permeates the very heart and soul of our protagonist, Andrew Pinkney. THE WOODWITCH is a real heart of darkness tale, which grows blacker and more disturbing with every turn of the page. It's been a ridiculously long time since I updated this website, the main reason being that I've been hard at it trying to catch up on commissioned work since my daughter Polly successfully completed her treatment for Hodgkin's lymphoma in February 2016. I'm delighted to report that Polly is now fit and healthy, and has just completed her first year at Edinburgh University, where she's doing an Art degree. The third part of my OBSIDIAN HEART trilogy, THE WRAITHS OF WAR, was released in October 2016, which now means that the trilogy is complete. I also wrote the official novelisation of the Matt Damon movie THE GREAT WALL, which was released around the same time, and I've been editing a horror anthology for Titan called NEW FEARS, of which more in a later post, once I have a cover to show you. I've also written a few short stories (again, more later) and have been working on a couple of exciting projects that I'm not allowed to talk about yet. Stay tuned for news on those!